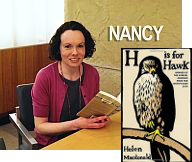 H is for Hawk by Helen Macdonald is a deeply personal memoir about grief, falconry, and T. H. White. A unique combination for sure, but Macdonald masterfully blends these threads into an engrossing work of art. I highly recommend listening to the audiobook narrated by the author herself for a particularly mesmerizing experience. Audio is also available on Hoopla.